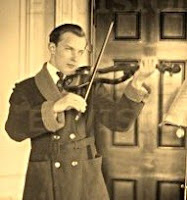 Vasa Prihoda was a Czech violinist born on August 24 (or 22nd), 1900 (Stravinsky was 18 years old.) His father, Alois Prihoda, was his first teacher and remained so for ten years. Afterward, Prihoda attended the Prague Conservatory, where he studied with Marak (who himself studied with Otakar Sevcik.) He graduated in 1912 and gave his first public performance playing Mozart’s fourth violin concerto (D Major.) Most violinists choose Brahms, Mendelssohn, or Paganini for a debut, but not Prihoda. It has been said that Toscanini discovered him playing in a Café (Grande Italia) in Milan, Italy, on December 27, 1919. Prihoda is remembered for his prodigious technique (which included exceptionally clear articulation), his ease in playing Paganini showpieces, and his 1930 marriage to (and 1935 divorce from) violinist Alma Rose (Gustav Mahler’s niece.) [In 1944, Alma, whose father had been concertmaster of the Vienna Philharmonic for 50 years, died in a concentration camp.] After the war, Prihoda was censured by the Czech government because he did not boycott any of the German-occupied territories during the war. Prihoda concertized extensively all over the world and made a number of recordings when the industry was in its infancy. Unfortunately, some of his recordings were not well-produced so the sound quality is poor. He played in the U.S. many times and was greatly admired for his style, dazzling technique, and finesse. Critics have suggested that Heifetz was jealous of him. Vienna was his base of operations for many years though he taught in Prague, Munich, and Salzburg as well. After 1950, he dedicated most of his time to teaching and he also composed small chamber works which are no longer played. Prihoda also composed his own cadenzas to all the concertos he played. He gave his last concerts in April, 1960 and died (of heart disease) on July 26, 1960, at age 59 - Heifetz would live another 27 years. There are many amazing sound files and videos of his posted on YouTube.